Hayley Megan French, See Where it Drifts, installation view, Galerie pompom. Photography by docQument. Background: Elliott Bryce Foulkes, Redaction, 2014. Is it somehow possible to experientially analogise the kinds of tensions that play out between cultural projections and geological formations within a relationship between the immateriality of the art condition and the physical stuff of suspended pigment on canvas? Much like the fictional world we call art, cultural projections such as nation only exist to the extent that people agree that they do. Far from enjoying any fixed or permanent status, let alone maintaining full consensus, cultural objects are thought into existence in many and conflicting ways. Although exercised via the immaterial functions of collective imagination, actions performed in the image of national identity nonetheless wreak tangible physical markings, scars, erasures and layers upon and within geological formations – let alone their impact upon pre-existing cultural projections. The island continent that we call Australia is at once a timeless physical geological formation and a historically layered series of cultural projections. Significantly, this island continent quite literally bears the same outline shape as the recently collectively imagined symbolic projection of nation that we now call Australia. For a mere blip in historical time, an obscenely new cultural projection has been superimposed over both the ancient geological formation that is its host, and by extension, the several hundred nations existing for many tens of thousands of years previously. Although the idea of landscape is seen as central to a sense of being in Australia, it also invariably evokes complex and unresolved historical, cultural and political tensions played out over a deep and long geological presence. Artists that deal with the idea of landscape in Australia are by default perpetually connected to these tensions—which are of course never more conspicuous than wherever they are refuted. Hayley Megan French is clearly mindful of the potential for art to play an implicit role within our abstracted experience of these deep, long and ruptured relationships. For French, conspicuous erasures and absences coupled with tentatively specific yet formless shapes work in silent concert to imply half forgotten and provisional unions within expanses of seeming emptiness—which upon closer inspection still maintain the scars and textures of previous registers of gestural incursion. 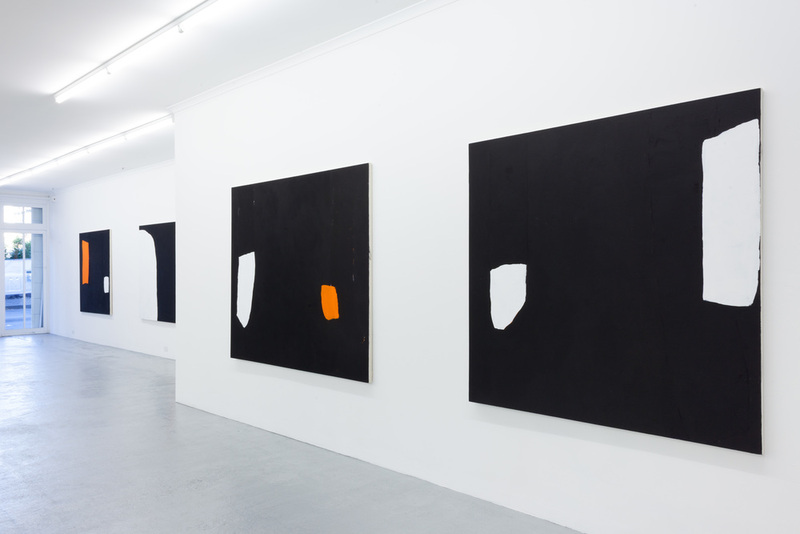 French’s latest paintings are layered and textured—white on black, orange on white, black and more black. Created through processes of sequential layering and erasure, these paintings are clearly not literal descriptions of landscape. By contrast, French transposes the kinds of relationships, gestures, and erasures that have played out within and across this ancient land into the language of painting. Offering no horizons or specifically mappable points of reference, French’s shapes appear to float in space and place, faintly echoing latent, invisible, and stubborn contradictions that dwell within the dreams, fictions and errors through which we have constructed our sense of being in this land. Some of these fragments are foregrounded. Others have disappeared in erased markings that still echo gestures that can now only be imagined. For painting, like landscape, is finally a register of performance enacted upon its surface. Painting remains a fertile ground on which to stage a dynamic play between a literal register of information and a space for the imagination to flourish. Here, conspicuous omissions and evacuations of the specificities of content can simultaneously imply a desolation that denies the past and make provisional connections within which to rebuild. In this way, French repeats cycles of consumption and excretion inextricably tied to our destructive yet fragile human condition and its dependence upon land. By orienting in thought through imagined spaces and formless shapes towards a land that actually exists, French provides a perceptual conduit for repurposing the play of invisibility and the limits of imagery. Just as vast expanses of landscape can provide solace and histories imbue feeling simply via our knowledge of their existence, art can facilitate forms of experience that exist beyond direct sense perception. By building experiences in the mind through the tangible materiality of paint, yet mindful of the paradoxical insight that full comprehension is impossible, French provides us with an effective vehicle for imagining the poetic play of absence and transsubjective identity. Jonathan McBurnie (JM): Tell me about your new exhibition. I believe it is your first ever solo show? Hayley Megan French (HMF): It is my first solo exhibition. The thing I am most excited about is the opportunity to show a whole series of paintings. I have always worked in series, however other than my grad shows at Sydney College of the Arts (SCA), I have not had the opportunity to show more than two paintings together. The series I am exhibiting is part of a consideration of landscape as central to an experience of being in Australia. This connection evokes complex and unresolved histories and cultural projections, layered over the land. The paintings are not literal descriptions of landscape, but a way of thinking through my relationship to the ideologies of landscape in Australia, through the language of paint. The show is titled See where it drifts and opens this Wednesday night, May 28 at Galerie pompom in Chippendale. I am exhibiting in Galerie pompom as an invited artist through MOP Projects, an artist-run space with which pompom has a collaborative relationship. I am very lucky to be part of this new program which invites unrepresented artists to exhibit in a reputable commercial gallery, with all the perks of publicity, administration and installation support. It has been an incredible experience just in the lead up and I am very much looking forward to installing and opening the show this week. I may be bias, but after working on the committee of MOP Projects for the past five years I think we can look forward to exciting things from this hybrid gallery model, expanding opportunities for emerging artists. JM: For those new to your work, how would you describe them? HMF: I always find it very difficult to describe my paintings, I feel as though I need to detach myself a little in order to do it. 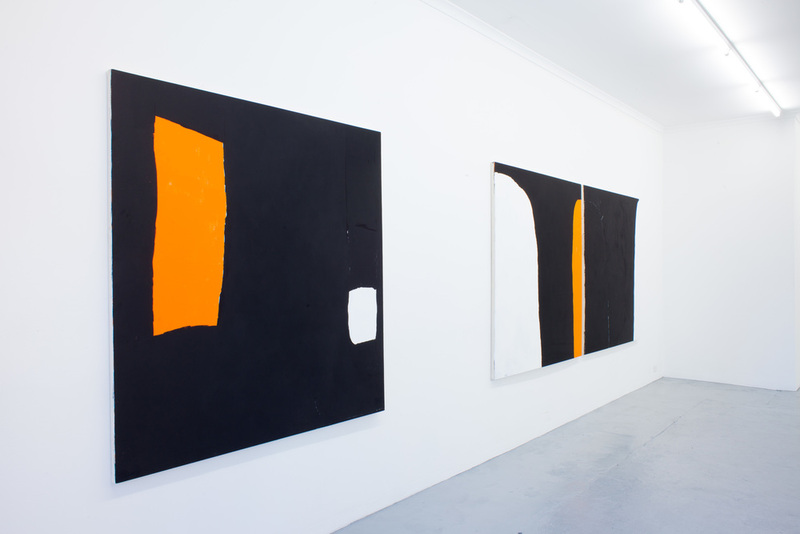 So, objectively speaking, the work in the show is a series of large, minimal abstract paintings with stark white and orange shapes moving about on a black background. On closer inspection, the background is heavily layered—the shapes are in fact fragments, not floating but anchored by shapes below the surface which bleed through the black paint. The colours themselves are layered, white over black, orange over white, black over the top. The underpainting is often evident in the edges of the shapes, as are the brushstrokes, which while controlled, are quite thick and rough. In a shift from my previous works, these fragments have been detached from the edges of the canvas and move about within the frame. Throughout the series there is a subtle negotiation of space and colour. in terms of your studio practice? HMF: I am still in the very early stages of my career so this experience has had a dramatic impact on my studio practice. To begin with, being able to work close-to full-time on my practice for a number of years has allowed me to thoroughly work through ideas as well as experiment with new ones. The relationships I have developed with my peers and teachers have also been fundamental to my development, as well as leading to quite a few collaborative projects. Come to think of it, it was a collaborative work with Stephanie Quirk in 2011 that first led me to using cadmium orange, which now features strongly in the paintings. Most importantly, it has given me the opportunity to critically consider the field I am working in, which I see as an important start to my career. JM: How do you balance both studio and thesis? Do you have a routine, or are you more scattergun in your approach? HMF: The two are inherently intertwined, which in a way helps me balance the writing and the studio time. In particular, if I am having any problems, often switching between thesis and painting can help me work through these problems. Of course at times, there is less of a routine, especially if I am getting ready for an exhibition or having to madly write for a deadline. I definitely notice if I have been out of my studio too long though, I start to get frustrated and anxious. I do need the balance. JM: You've been interviewing a lot of artists as a part of your research, some of whom have not gotten much academic attention. Have there been any particular highlights for you? HMF: Interviewing artists has been the highlight of my research. I was very nervous, at first, to approach people, but it has been overwhelming how generous many people have been with their time and ideas. It has been such a pleasure to find artists, curators and historians with whom I can have honest and productive conversations about what it is to be making paintings in Australia today. I remember fondly one of my first interviews with Nick Pike. I drove up to his house in the Blue Mountains where he was also working from. We had a really great chat about his paintings and his thoughts on the Australian painting scene after returning from living in the US for a few years. I think it is incredibly important to the research, to be speaking directly to artists about their work and their thinking. On top of this I have been able to travel to quite a few places in Australia now as well as visit some great studios. Having said that, I think some of the interviews I have done with Sydney-based artists, as well as a few of my peers at SCA, have been incredibly valuable in finding artists with similar areas of interest that I will continue to work with. JM: You have had a few research trips to remote indigenous communities, and another coming up. Tell me about that. HMF: I have been incredibly lucky to spend time working in the art centres in Warmun in the East Kimberley region and Yirrkala in Northeast Arnhem Land. They really have been life-changing experiences for me in many respects. The trips have been a significant part of the research project; particularly in thinking through the major influence many remote artists have had on the wider field of contemporary Australian painting and specifically on my own practice. It is quite an honour to witness an artist at work and gain an insight into their process. I learnt a lot about the work, the artists and the cultures I wanted to write about this way. I am looking forward to returning to Yirrkala in July this year, in particular to learn more about the work of senior Yolngu artist Nonggirrnga Marrawali whose latest paintings have informed my thinking in both the studio and the thesis on what it means to be influenced by Aboriginal painting. JM: To me, the relationship the art world has with indigenous artists has brought about some really great empowerment and also cross-cultural awareness in terms of indigenous issues, but also some really bad cases of exploitation. I have also noticed a distinct lack of focus on such issues in the last few months, which not coincidentally, coincides with the last election. You have seen both worlds first-hand. What changes in policy or just general human interaction would you like to see in this respect? HMF: I am not an expert on policy, and I can only speak from my brief experience. In my experience of this research project, and in particular visiting the remote communities, I am aware the more I learn, that is very difficult to be informed across the full spectrum of arguments and experience. I have also become increasingly aware of my very specific and contextual perspective—this has in fact been one of the most interesting outcomes of doing a PhD. The comment that I will make is that, from the perspective of living in the city, it is glaringly obvious that we need to improve our education system and strengthen our learning on Aboriginal cultures and the history of Australia. It is very difficult for people to form healthy relationships when our education in this regard is so lacking and has been for far too long. JM: Back to your exhibition. This body of work is obviously quite abstract, but also seems to incorporate elements of the figurative. Whose work informs this kind of tension in your work? I am reminded of Richard Serra, Sally Gabori and, in a weird way, Paul Gauguin. HMF: I suppose the shapes in these works do appear somewhat figurative, perhaps in part due to the bodily scale of the paintings. It was really more the movement of the shapes that came into play here, created through an erasing of larger shapes that initially referenced a kind of framing of the space within the canvas. I think there is a tension in the figure/ground relationship—the shapes are at times foregrounded, at others, determined through a process of erasing, foregrounding the black over-painting. This kind of tension has been played with throughout the history of western abstraction, but yes, Richard Serra along with Tony Tuckson, Robert Motherwell, Ian Fairweather and Debra Dawes come to mind. In fact, Debra had a huge impact on the way I now approach painting during my undergraduate studies. I was standing on a chair, painting circles on a 2m canvas when white paint dripped off my brush onto the finished part of the painting. Debra came running into my studio after I sort-of screamed and said very quickly to me, not to touch it. After much deliberation I did leave the drip and the process of making has become more and more evident in the surface of the works since then. As I mentioned also, Nonggirrnga Marrawali has been a big influence on this series, particularly through the spatial relationships of her latest bark paintings. JM: Best of luck for Wednesday night. HMF: Thanks Jonathan, I appreciate it.